You build your music career much faster with a record company behind you. Record companies have access to resources and capital you cannot match as an independent musician. Their resources grow your music career to a higher level than you could reach on your own. To get a record deal, you must know exactly what record labels, music producers, and artist management companies are looking for when seeking out new artists. You also must know how to acquire the things record companies look for…and give them what they want. This makes the difference between you becoming hugely successful or giving up on your dreams and getting a non-music related day job. Most musicians never get a record deal because they don’t think at all about what record companies want from them. Answer: record companies want to make money. A record company is no different from a venture capitalist who provides funds to startup businesses. An investor invests money into a business only if he believe the business has the potential to become profitable and pay back the investment (with interest). Record labels, managers, and successful bands are looking for artists who think in terms of mutual benefit. You must think in this way before any company in the music industry will want to work with you and invest their money and resources into your music career. To become a successful business partner of any record company, you must first grab their attention. This quick test tells you what things you need to acquire to get record companies interested in you. Don’t seek to be merely an employee of a record label. Think in terms of a win/win, value-added partnership. You and the record company add value to each other to reach your respective goals. You get access to record company’s resources that grow your music career, fan base and income. 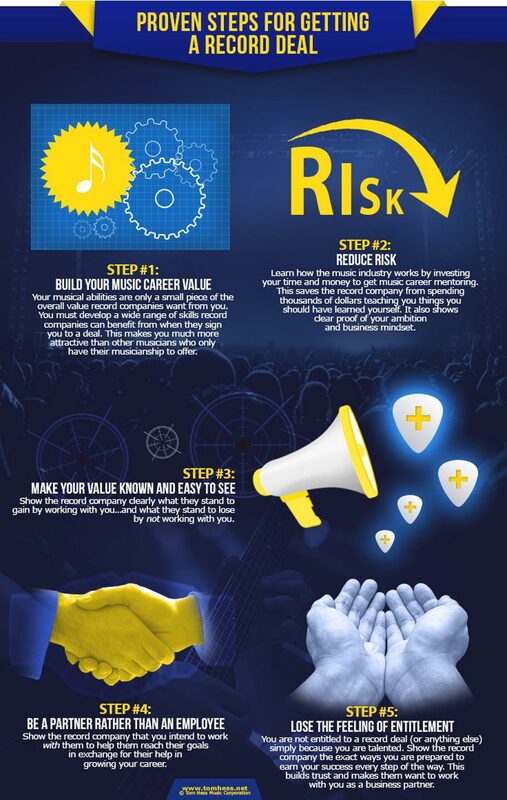 Record company gets a portion of your growing music career income in exchange for taking the risk of investing in you. Do not feel like you are entitled to receive money or opportunities simply because you are talented. It is not the record label's job to reward you for your music. It’s their job to reward you for the value you bring to them (beyond the music). Make it easy for the record company to work with you. You do this by learning as much as possible about how the music industry works before you seek a record deal. Record company executives expect you to know how the music industry functions BEFORE they begin to work with you. They don’t want to answer basic questions about the music industry, general business, mental attitudes, image, stage presence, logistics, etc. They also don’t want to waste time and money teaching you things you can and should learn on your own. How To Make Big Money In Music Learn the top 5 ways to make big money as a professional musician. a lot more serious and loyal fans. What Music Companies Want Most Learn what music companies want from you & how to give it to them. When you get training on how the music business works, you show initiative, commitment and a strong mindset. These attitudes set you apart from thousands of other musicians who compete with you for a record deal. You also help reduce the risk record companies have to take by agreeing to work with you. Imagine that your band was put on tour by a record label, but the management believes that your band does not know how to conduct yourselves on and off stage. They will require you to be coached in these areas. (This is very common for new and inexperienced bands.) Rehearsals take an additional week (at the rate of thousands of dollars per day). Money spent on extra rehearsals is subtracted from the rest of the budget allocated for your tour, record promotion and music career. That said, this extra money must be paid back to the record label first before your band sees any profits from the tour OR your record. You can easily get music business, career and mindset coaching before you work with a record company. Then make this fact known to the record company when you contact them. This positions you as a win-win partner with much lower risk and avoids unnecessary waste of the company’s money and resources. You become a much more likely candidate for a record deal. Adopting the success-focused mindsets helps you build the thriving music career you want much faster and easier. This quick test tells you what things hold you back from massive success in the music industry.